The Bob Timberlake Inn at Chetola Resort is an elegant, unique Bed and Breakfast located in Chetola's Manor House Estate Home. You will be cared for by our personal innkeeper who services the inn’s select eight rooms. With a personal pantry, nightly wine and cheese social, private parlor and library, and exclusive entry, no detail has been left untouched. The main features, of course, are the Bob Timberlake furniture, artwork, accessories and mementos Bob has personally selected to adorn the Inn. Each of the eight rooms is distinctly unique, designed to reflect the time period of the 1920s to the 1940s, bathed in color schemes of rich golds and neutral tones. The rich tapestries and upholstery fabrics are elegant yet cozy, with the window and bedding ensembles, architectural treatments, custom moldings and decorative period lighting all reflective of Chetola's Golden Age, when Luther Snyder owned the estate. The Inn truly is a blend of historic elegance and modern day Bob Timberlake style. Bob Timberlake is an internationally known Realist artist and designer, famous for his realistic depictions of simple living in his native North Carolina. Timberlake is also known for his line of best-selling home furnishings that have revolutionized the furniture industry with their genuine, hand-crafted character and their casual, but elegant style. Bob Timberlake accessories, rugs, lamps, clocks, wall décor and even garage doors, millwork and home plans complete the total home offering of the brand. These varied endeavors over the years have proven Timberlake's incredibly distinctive creative ability. Chetola is a magnificent resort surrounded by the majestic Blue Ridge Mountains. When Bob Timberlake and Kent Tarbutton, the owner of Chetola Resort, joined forces to create a unique Mountain Inn, the results could only be spectacular - a work of art surrounded by natural beauty. The mountains have always been a haven for Timberlake and have even inspired some of his original works of art. An artist's soul and an intensely creative spirit have led Bob Timberlake into many ventures over the years. He began his professional art career over thirty years ago at the urging of well-known artist Andrew Wythe. Timberlake has held art exhibitions all over the United States at venues like Hammer Galleries in New York City, the Corcoran Gallery in Washington, D.C. and the Frye Museum in Seattle, Washington. Known for his realistic treatment of everyday beauty such as snowy fields, a bucket of summer cherries or a pitcher full of colorful flowers, Timberlake captures the simple, gorgeous moments that give life its richness. Over the years, Bob Timberlake's work has been featured in scores of magazines and newspapers and three hardcover art books. "We couldn't imagine a more natural partnership. Chetola blends so well into the natural beauty surrounding it. There is such a strong heritage of craftsmanship in the North Carolina Mountains and my collection has always drawn its inspiration from the craftsmen, potters and artisans native to North Carolina. We are excited to offer the grand history of Chetola paired with the classic style of my collection to the public. I can't imagine a more natural combination or a more relaxing retreat." 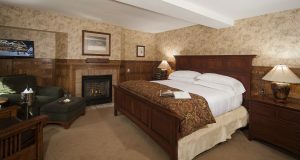 Each room in the Bob Timberlake Inn is named for a prominent individual who was part of the historic fabric of the resort and town, from private owners to families who were caretakers through three generations. 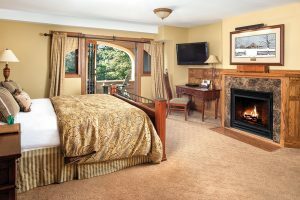 All inn rooms feature either a king or queen bed, flat screen television, fireplace, whirlpool tub, in-room safe and robes. Most rooms have a view of Chetola Lake. Guests enjoy daily breakfast in the privacy of their own room or Timberlake's Restaurant (located on the main level of the Inn). Guests can visit the Inn's Pantry at their convenience. The Pantry is well stocked with snacks such as ice cream, assorted beverages, coffee, hot chocolate and more. The inspiration for our handsome 3rd Floor Library was the smoking room of yesteryear when folks would gather round with an after dinner brandy and a cigar. Although the entire Bob Timberlake Inn is a smoke-free building, one will relive that atmosphere that was popular so many years ago. The Library is a comfortable, warm area that all guests can enjoy at their leisure. The reading selection offers great variety... from vintage Life magazines to well-known novels. All guests enjoy a complimentary Afternoon Social complete with hors d'oeuvres nightly. All guests are provided with nightly turn down service, which includes freshly baked cookies. Guests may enjoy use of all facilities at the resort including the indoor pool, Jacuzzi, sauna, fitness center and workout room, tennis, boating, Orvis endorsed fishing, hiking and more. The Spa at Chetola offers manicures and pedicures, massage therapy, facials and body treatments. The Health and Wellness programs offer a wide variety of fitness classes and programs -- from yoga and water aerobics to cooking classes and personal trainers. Please visit the Highlands Sports and Recreation Center for a complete list of activities. MINIMUM STAYS are required for some weekends, holidays, and special events. SEASONAL SURCHARGES are required for some weekends (July, August, October), holidays and special events. Rates are for rooms with one or two occupants. CHECK-IN TIME IS 3:00PM ; CHECK-OUT TIME IS 11:00AM . NO PETS ARE PERMITTED ON THE PROPERTY. A PHOTO ID AND A VALID CREDIT CARD WITH AN AVAILABLE LINE OF CREDIT FOR THE TOTAL AMOUNT OF THE STAY IS REQUIRED TO CHECK IN. SMOKING POLICY: ALL ROOMS IN THE BOB TIMBERLAKE INN ARE NON-SMOKING. AGE POLICY: INN GUESTS MUST BE 21 YEARS OF AGE OR OLDER. Advance reservations are recommended. Major credit cards are accepted for guaranteeing reservations. Prices above do not include state tax or occupancy tax. Payment made with cash, Mastercard, Visa, Discover Card, Traveler's Checks, or personal check (with proper identification and a major credit card.) Debit cards are not recommended. A Photo ID and a valid credit card is required at Check-In. Seven-day advance cancellation notice is required for a refund. Requests for date changes will be subject to availability. Rates are subject to change without notice. Services and amenities do not apply to group bookings.